From spy shots to international launches, we have been getting information of the new Yamaha YZF-R15 v3.0 for a long time. Until before its launch at the Auto Expo 2018, every bit of information only added to the anticipation. Now that the motorcycle is finally here, let’s take a closer look at how it is different from its predecessor. Design: This is the most obvious of all changes. The R15 v2.0 was launched in the Indian market in 2011, and since then, except for a few minor updates, there haven’t been many changes to its design. Needless to say, what was once an aggressive and sporty looking motorcycle was starting to show its age. This third-generation model has been inspired from the new YZF-R1, and it revives the R15’s long association with those adjectives. It has a sharper silhouette, smoother flowing lines from the front to the back and the much-wanted big bike feel. Features: Like I mentioned before, the R15 v2.0 was starting to show its age not just in terms of design but also in terms of features. Thankfully, Yamaha has addressed this in the new-generation model. To start with the basics, the R15 v3.0 comes with LED headlights and taillights, newly designed alloy wheels and an all-digital instrument cluster. Yamaha is also offering the v3.0 with new colour options. In sync with the nature of the motorcycle, Yamaha has also fitted the R15 with slipper clutch. ABS, however, is not offered, even as an option. 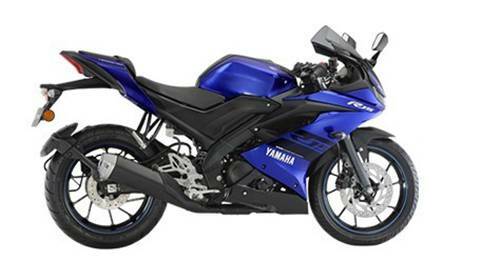 Engine: The Yamaha YZF-R15 v3.0 uses the same engine as its predecessor, but it has a slightly longer bore and stroke. The new R15 now produces 18.70bhp and 15Nm from a 155cc single-cylinder, liquid-cooled motor. This updated engine comes with what Yamaha calls Variable Valve Actuation (VVA). While this allows Yamaha to use a single overhead cam, the VVA should also improve the low-speed rideability of the new R15. The engine continues to be mated to a 6-speed gearbox. Yamaha promises a 4.7 percent increase in overall fuel efficiency, but we’ll only be able to verify the claim after we get it for a test in the real-world conditions. 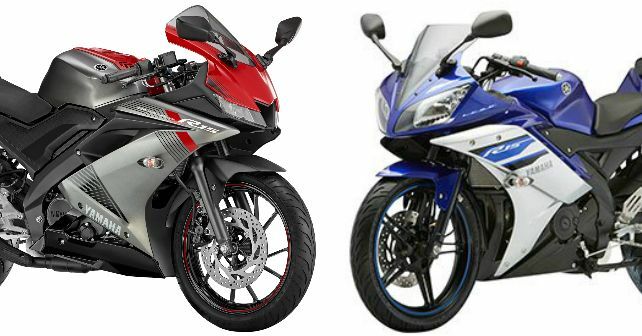 Dimensions: In terms of dimensions too, the Yamaha R15 v3.0 is different from the outgoing model. The R15 v3.0 is 1,990mm long, 725mm wide and 1,135mm – an increase of 20mm, 55mm, and 65mm from the outgoing model, respectively. The seat height is now up to 815mm, but it shouldn’t be much of an issue for average-sized riders. Ground clearance too has increased by 10mm. But the most interesting improvement is the reduction of wheelbase by 20mm – this should surely have a positive effect on the handling of the motorcycle. Up front, the R15 v3.0 also has a larger disc, and it should result in better braking performance. The first-generation R15 received a lot of slack for its skinny tyres (although they performed perfectly well), in the v2.0 Yamaha has increased the tyre size. The R15 v3.0 comes fitted with a 100/80 section front and a 140/70 section rear. Price: Yamaha launched the YZF-R15 v3.0 at the Auto Expo 2018 at. Rs 1.25 lakh, which is roughly Rs. 7,000 more than the model it replaces. Now some might consider Rs 1.25 lakh to be on the higher side for a 150cc offering, but for the additional charge you get a better-looking motorcycle, more features, marginally increased power and larger brakes and tyres. We will ride the Yamaha YZF-R15 v3.0 soon, so stay tuned for a detailed review.